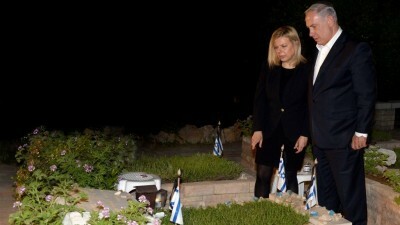 Image: Benjamin Netanyahu and his wife Sara at the grave of Netanyahu’s late brother Yoni at the Mt Herzl military cemetery in Jerusalem last year. The article glorifies people whose lives were lost in vain. Why did they lose their lives? For the ruler, for the government. They want to make us think that these people were so brave and patriotic they sacrificed their lives for us, so that we will continue to send our loved ones to their wars. And it is very painful to me. My beloved brother didn’t die because he was brave and was protecting me. He died because he was in a stupid war and war is as you know a terrible situation and another soldier who was in a panic shot my brother. If there is one day in the year I can’t stand, it is memorial day. I miss my brother not because he lost his life in a war but because he was a wonderful person, and I don’t need this memorial day to remember that I miss him. I don’t need people to drop their heads and say, they feel terrible for me. That is what they do when the alarm sounds, and the day of mourning begins, they stop and drop their heads. I used to go the cemetery because I could not hurt my sister. For years I went along with the waves. I needed time to understand: that this mourning is a way of dancing on their blood. They have a special cemetery for the soldiers. It’s upgraded– not a regular cemetery. The Prime Minister comes to the Jerusalem cemetery because it is the most important cemetery. And the second most important cemetery is in Tel Aviv, and the minister of security goes to that one. And so on, down the line. When they say, we feel for you, you mourning families, I feel like I want to send my fist into their faces. Because armies are government terror. But they must tell us that we’re patriots. Yes I know: Netanyahu is in my position. He also lost a brother. But if anyone is using his loved one’s death, he is. I saw that the government sent a photographer to take a picture of Netanyahu and his wife at the grave. They were standing there wearing black. Never mind that the tradition of wearing black comes from Christianity. But they were standing over the grave, at the stone, with their heads down. It was disgusting to me: if he feels such pain for his brother, why does he pose so the entire world will see his pain? I don’t need to have everyone see me hurting. So I think: His brother’s loss is something that he can use. In the New York Times article, I don’t think the mother realized how she was used. He couldn’t be a musician, he had to be in combat, the article said. Because he was a patriot, that was the message; he lost his life for all of us. The article “fills the eyes with tears” with every word, says this other journalist on twitter. That is the easiest way to manipulate people, through emotions. How can one argue with a mother that lost her only child? But I think: to be born is such a miracle. In a very specific moment, one sperm has to meet the egg and make life. And then, in a moment, he loses that life. And I remember the 1973 war. There were 2800 victims of that war, and they were victims of their own government. Some people say that Golda Meir was stupid not to have made a deal before for the Sinai. But the truth is, any Israeli Prime Minister would have acted in the same way. Because of arrogance. But that war should not have happened. It happened because of the stupidity of the leaders. Which is why I call them liars, not leaders. Of all the wars of Israel, it was the only war that had to be: Israel was attacked in ’73, and they responded. But it was in vain. It wasn’t supposed to be. If they had only spoken with Sadat, beforehand, there would not have been a war. As I told you when we spoke last summer, I don’t want to justify myself as a mourning person in political discussions. I think I should be free to speak my mind regardless of any background. Among other reasons, it is selfish. It was my brother who lost his life. The loss was his, his life, and he wanted to live. So am I going to use his death to glorify myself as a mourning person? No. Still I know that I have also used my brother’s death. You called me for that reason, and I agreed to talk to you. My loss does not make me wiser or an expert. I just don’t agree to be scolded for not being understanding when people are mourning. On Facebook, someone got furious at me for things I said about Israel. She said, How can you talk this way, families are mourning. And I said, I had my loss too.